For my birthday in April, I was given a gift certificate stating I was scheduled to attend a 2-hour, Trapeze 101 class at Trapeze U in Gilbert, Arizona. Needless to say, it was an unexpected gift. I’m not sure I had ever considered flying on a trapeze. I had no idea there was even a trapeze school nearby. Several years ago, and for no real good reason, I earned the nickname Flying Galindo (Flying G for short). Flying Galindo sounds similar to the Flying Wallendas, the legendary high wire family. That’s probably what made this gift so appropriate and such a good idea. Now I could live up to my nickname. After the surprise of the gift wore off, I checked out Trapeze U’s website. I began to get really excited. This was going to be fun. Fast forward three weeks to the morning of Saturday, May 15th, 2010. My class was scheduled for 8:00am to 10:00am. What an incredible experience. I climbed the ladder and flew on the trapeze a total of eight times that morning. It was exciting and scary all at the same time. Each time I stepped onto the platform to jump, my heart was racing. Each time I landed and climbed off the net, the adrenaline was flowing. All I could say afterwords was “What a rush!”. 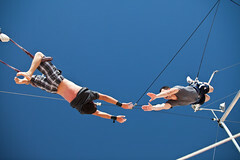 The following video and photos show several of my attempts flying on the trapeze. David Galindo – Trapeze 101 Class from David Galindo on Vimeo. I would like to say the folks over at Trapeze U are incredible. They made the whole experience safe, exciting and fun. I’m giving them two thumbs up.